I'm psyched to announce that we've made some new figures! Securely packaged in their clear mini-studio with genuine faux-bamboo floor are SEVEN new additions to the Yoga Joes team: Eagle, Wheel, Peaceful Warrior, Triangle Pose, Happy Baby, Plank, and Downward-facing Battle Dog. Pre-order them here for $20. One of the most euphoric yoga poses of all time for those of us that suffer from back pain, Happy Baby has joined the squadron, as our first kinetic yoga joe. We intentionally curved his back, so he can tilt back and forth, like we all do for Happy Baby. End result? Gently flick him with your finger and buckle-up for some sweet side-to-side Yoga Joes rocking action! Eagle pose balances on one foot without a yoga mat, which is a feat of engineering I feel is on par with building the pyramids or sending a man to the moon. Seriously, this took time. (But I like Eagle a lot, so well worth it.) We worked closely with actual yoga instructors to make the pose accurate and authentic and, as always, the closer we got to the actual pose, the better our Eagle guy balanced. 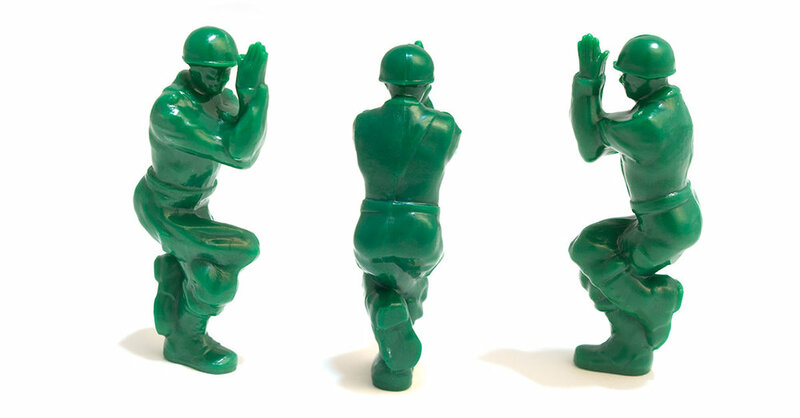 Back when we first got started, the way we got tricky Yoga Joes to balance was by sticking them on a mat. No more. We’ve gotten better at modeling new figures to balance and, much like in our own yoga practice, have actually come to enjoy the challenge of getting poses to work. Also, we find Yoga Joes just look cleaner without a mat, and every now and then mats break or come loose. But some of you like the mats, so we included a yoga mat as an accessory in Series 2 that you can use as you see fit. We had long wanted to make a K9 Yoga Joe, and with Series 2, that dream is now a reality. Downward-facing Battle Dog has a Kevlar vest he wears whether sniffing out bombs or schooling his human counterpart (namely Downward Dog guy from the original Yoga Joes set). Downward-facing Battle Dog speaks to our love of dogs and also our love of terrible puns, and we hope it will do the same for you. I hope you like them! Pre-order your set now for a 20% discounted price. These babies are scheduled to ship on October 20th. Thanks for your continued support and keep emailing me your favorite yoga pose suggestions at hello@brogamats.com. A lot of these figures originated as suggestions from happy customers, so keep ‘em coming!